Down & Dirty: I'm ready! 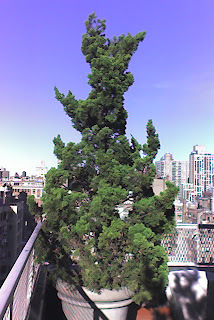 Tuesday morning I got an email from a worried client; one of her large evergreens had tipped over in our latest winter storm. This isn't the first time the tree has fallen, and frankly I wasn't looking forward to the fix. It's winter in New York City (i.e. not the growing season) and gardening in 30 degree weather isn't my idea of fun. But, being a responsible small business owner, I dug out my tool bag and made my way to the terrace. Fortunately, the pot hadn't broken, but the wire that held the tree in place had ripped through the wire mesh of the terrace fence. The tree was seriously top-heavy, so I took off 3-4 feet, doing my best to preserve the twisty shape of the tree. Next, I thinned the body. I hoped pruning a few of the interior lateral branches would decrease the sail effect, allowing the wind to pass through the tree rather than push it over. As I worked, I warmed up...in more ways than one. I unzipped my jacket and took off my hat. More importantly, I started to have fun. The fresh air felt great, and I stepped back to judge the shape of the tree. It looked good. In fact, it looked better than it had in the five year's I've been tending this garden. Pruning the tree brought out its personality and let it breathe. My client had asked the building super to help me stand the tree up again, but I muscled it into place by myself and tied it in, this time attaching the wires to the sturdy top railings. I'd forgotten how good it felt to push and strain, to saw and prune, in the sun and fresh air. It might still be winter, but on East 79th Street today it felt like the first day of Spring. P.S. Didn't have my camera, so this photo is from my cell phone. You captured it! I sure wish i was there to help you with that. Hey Ryan, I'd hire you in a second! Why don't you leave all that west coast tech stuff behind and come back to the garden? Did you recognize the terrace? It's the wrap-around on 79th where you spent a lot of time pruning a large Chamaecyparis (among other things). Terrific job--it looks great. I'm ready for Spring, too, though I know we've got a ways to go.